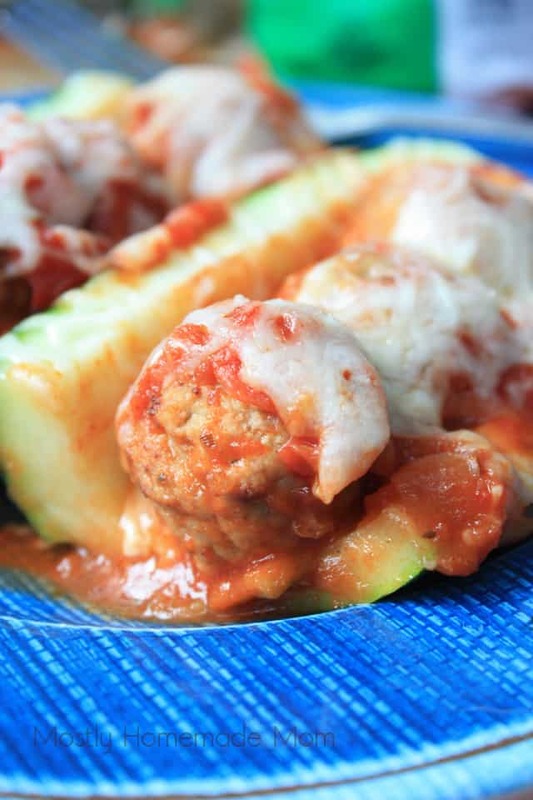 Cheesy Meatball Stuffed Zucchini is super simple and easy for a weeknight meal! 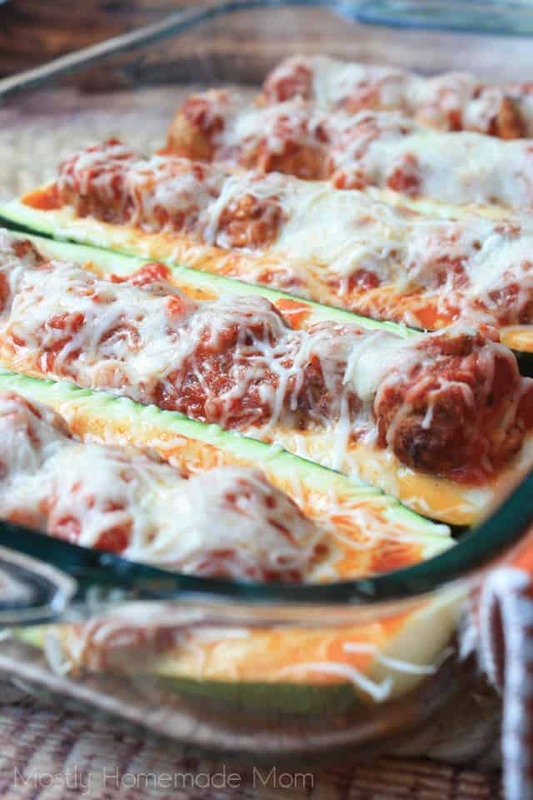 Zucchini boats filled with tomato sauce, meatballs, and mozzarella cheese – your family will go nuts for this recipe! It’s safe to say that meatballs are a favorite dinner around here. I pretty much always have a frozen bag of meatballs on hand in the freezer for a quick and simple last-minute meal that doesn’t require very much mental effort on my part. When dinner time rolls around, most days my mental capacity has hit its limit so I thrive on meals like that – ha! While meatballs are always a winner around here, I can certainly not say that same for anything incorporating vegetables. These kids can spot green food a mile away and most days want nothing to do with it. 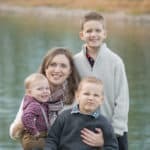 Silas and Reuben, my oldest and youngest, will most times just simply not even try it. Wesley will usually try whatever vegetable it is if we coax him into it, and a lot of times he actually does like it, or at least he says he does even though he winds up leaving most of it on his plate. 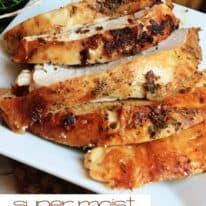 Zucchini is actually one of my absolute favorite vegetables, and Paul’s as well, so I can tell you without a doubt this was a winner of a dinner according to our taste buds! The boys, as usual, gave me issues with the zucchini part – but ate up 100% of the meatballs, sauce, and cheese. At least they tried it this time! Both actually reported that it tasted good, even though they left quite a bit of “green stuff” on their plates. 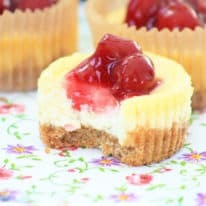 I will be trying this one again with them, for sure! 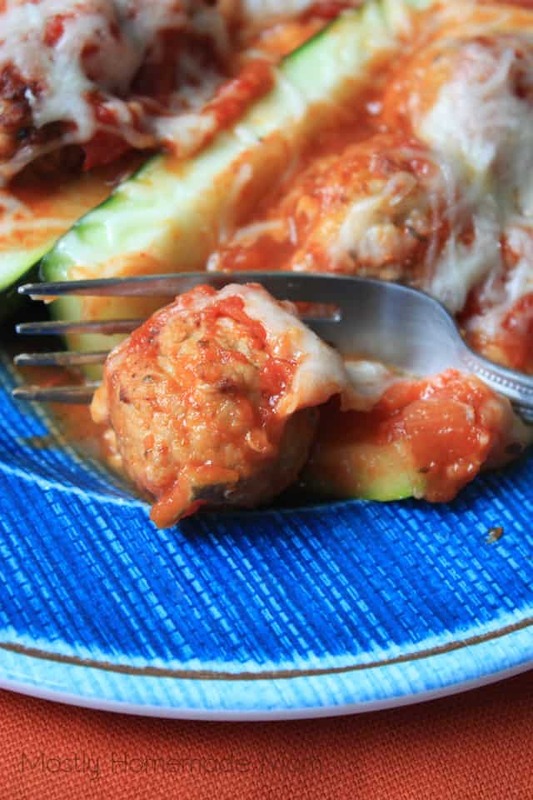 Cheesy Meatball Stuffed Zucchini is super simple and easy for a weeknight meal! 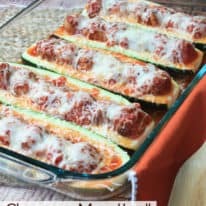 Zucchini boats filled with tomato sauce, meatballs, and mozzarella cheese - your family will go nuts for this recipe! Slice off the ends of the zucchini and halve each length-wise. Scoop out the inside of each zucchini half, leaving about 1/4 inch of squash inside. Discard or save for another use. Place zucchini halves into a 9 x 13 inch baking dish. Spoon half of the tomato sauce into each zucchini boat. Line frozen meatballs into each zucchini half. Top meatballs evenly with remaining tomato sauce. Cover tightly with foil and bake at 350 degrees for 45 - 50 minutes or until zucchini is mostly tender when pierced with a knife. 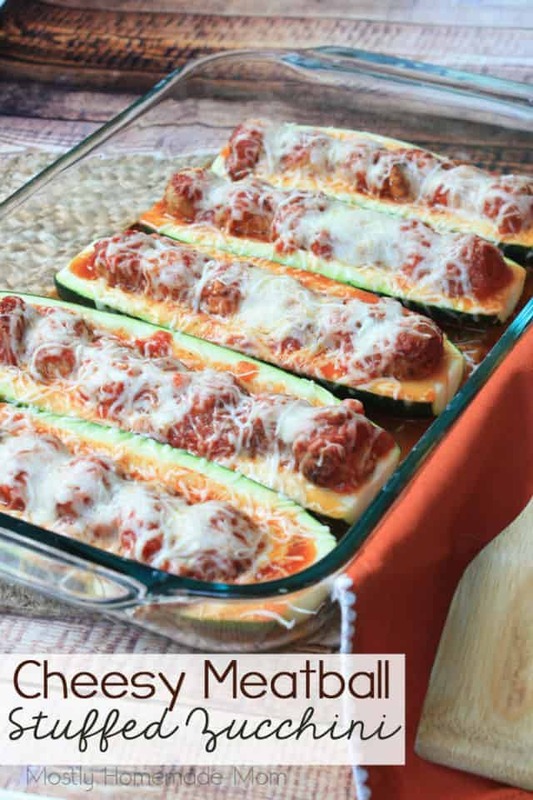 Remove cover and sprinkle mozzarella cheese evenly over stuffed zucchini. 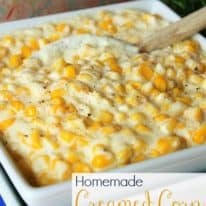 Return to the oven and bake an additional 5 minutes or until cheese is melted. Allow zucchini to cool 5 minutes before serving. 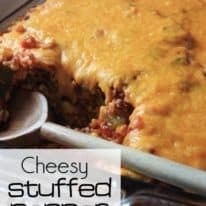 I’m actually planning on making 2 dishes of this amazing dinner next time and freezing the second one for an even faster dinner this winter. Another thing I’m looking forward to is using some home-grown zucchini in this with next year’s vegetable garden – hopefully I’ll have more luck growing zucchini then! 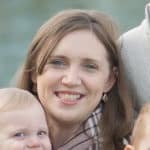 Cooked Perfect has been my go-to brand of frozen meatballs for years now, and I’m super excited to recommend them to you all. 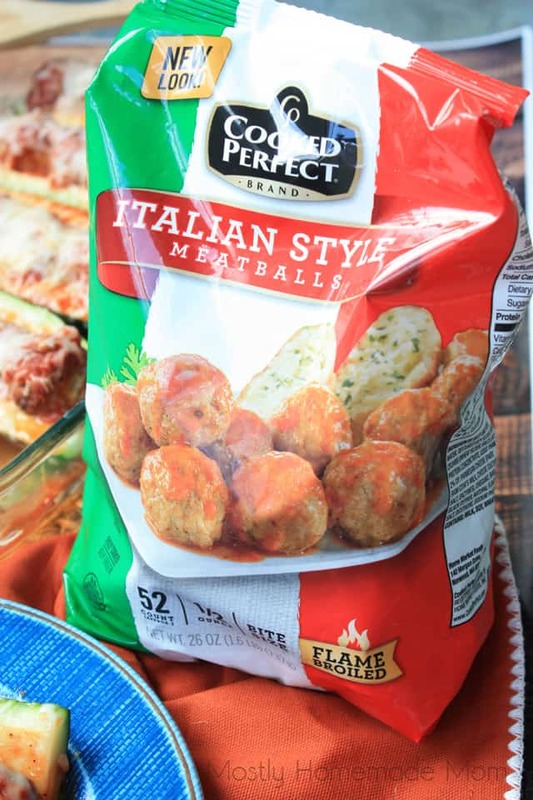 I absolutely love that Cooked Perfect® Meatballs have several different varieties to choose from depending on the type of meal you’re making: Italian Style, Gluten Free Italian Style, Homestyle, Angus Beef, and Turkey. 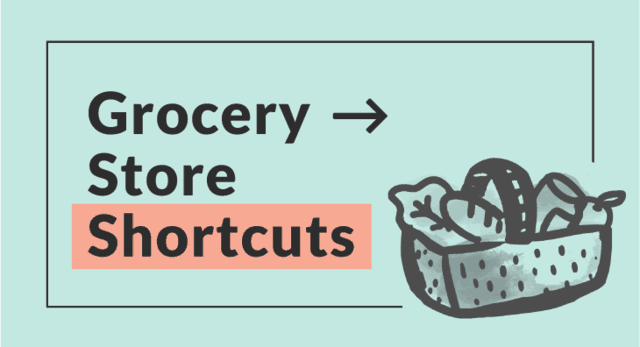 I love being able to pick up a bag or two in the frozen section of my grocery store during my weekly trip. It’s so convenient! Click here to Save $1 on your next purchase of Cooked Perfect Meatballs. And if you need more delicious dinner ideas, Browse more meatball recipes here!